Augmented reality is beginning to leak out into the mainstream world. This is thanks, in part, to ARKit and ARCore. These releases turned the current smartphones owned by millions of Apple and Android users into AR-capable machines. And while there are definitely some awesome use cases for mobile AR, the real future in AR is headworn. Latest Update: The most talked about wearable AR headset in recent months is the Magic Leap One. Recently, Sennheiser solidified its partnership with Magic Leap with the release of the Ambeo AR One, the first spatial audio headphones certified for use with the Magic Leap One. Also, Magic Leap has announced a $500,000 fund to encourage independent developers and producers to create new experiences for the Magic Leap One. These are just a couple of the developments following Magic Leap's successful tech conference in Los Angeles earlier this year. Didn't get to attend? No worries, we have all the information about the event and what was announced here. However, if you're an early adopter—but not a software developer—you might be a bit confused as to which AR headset is right for you. 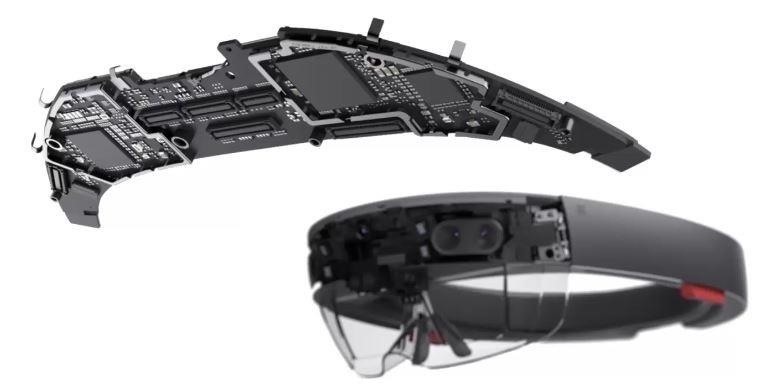 The Microsoft HoloLens is without a doubt the highest profile augmented reality head-mounted display on the market. That status could be due to the marketing efforts of Microsoft, or it could be related to the simple fact that nothing else currently on the market has a comparable feature set (a point some might debate). Regardless, Microsoft has taken a massive step into the world of spatial computing with the HoloLens, leaving some large footprints behind for everyone else to follow. As a standalone headworn computer capable of projecting images that appear to be in the real world, the HoloLens is the first of its kind. With a collection of sensors and cameras, the HoloLens is constantly scanning the space around the user and updating a 3D mesh of that area in what is referred to as a spatial map. This spatial map allows the HoloLens to interact with the world in ways never seen before its existence. Virtual objects can collide with this mesh in a such a way that it would appear that the object just bounces off the user's couch or desktop. Another feature of this spatial map is occlusion. So if you have your home mapped correctly, and you bounce a virtual ball off the wall, it can, for example, disappear as it rolls into your kitchen, just as it would in real life (IRL). The primary source of input for the HoloLens is gesture and voice control. While some standard Bluetooth devices such as keyboards, mice, and game controllers can be used with the headset, it has a very different interface compared to what we're used to in the flat screen world. Though it has Windows 10 at its heart, the interface allows icons that look like windows to be placed anywhere in the 3D space around you. So just as you'd keep your PlayerUnknown's BattleGround gaming icon in the top right corner of your traditional desktop, with the HoloLens you can, for example, keep the icon for Word floating above the dining room table. The hardware driving this device includes three processors: a CPU and a GPU, both of which are reported to be Intel Atom processors, as well as a custom processor designed to handle the sensor array input called the HPU (Holographic Processing Unit). The headset contains 2 GB of RAM and 64 GB of storage. A common (though arguably unwarranted) complaint with the HoloLens is its limited field of view (FOV). While the edges can seem chopped off at first, after prolonged use, the user generally adapts. But while the FOV eventually becomes less of an issue, the weight of the head-mounted device can become noticeable after extended periods of use. Beyond the limited footprint of the device in terms of sheer sales numbers, there's one thing Microsoft has managed to accomplish in rapid fashion: successfully building an ecosystem called Windows Mixed Reality. This special version of Windows 10 is designed to combine VR and AR experiences with the Windows 10 operating system. Now that the HoloLens has been out in the wild for nearly two years, a collection of polished software solutions have begun to make their way into the Windows Store. As this trend continues, with Microsoft having a notable head start on would-be competitors, it will be interesting to see who does and doesn't adopt this new computing platform. Meta, a company based in Silicon Valley, emerged in 2013 on the back of a successful Kickstarter campaign. After launching the first version of its product in late 2014, and gaining financial backing, the company announced its follow-up headset, the Meta 2, in February of 2016. In recent months (late 2017), developers actually began receiving the product. Unlike the Microsoft HoloLens or Magic Leap One: Creators Edition, the Meta 2 is a tethered, head-mounted device. That means it requires a connection to a traditional PC to function and is designed to be used in a stationary location, with no ability to wander around your real world environment. Crafted around the idea of being a replacement for your 2D screen, Meta 2 plugs into your computer's video port, with sensor input and image processing being handled by the connected PC's processors. Upon putting the Meta 2 on your head, after the initial shock of the size of the device (it's big), you're instantly aware of its field of view, which is massive, likely three times the size of the HoloLens. And there's something really nice about that image. But something is off, too. 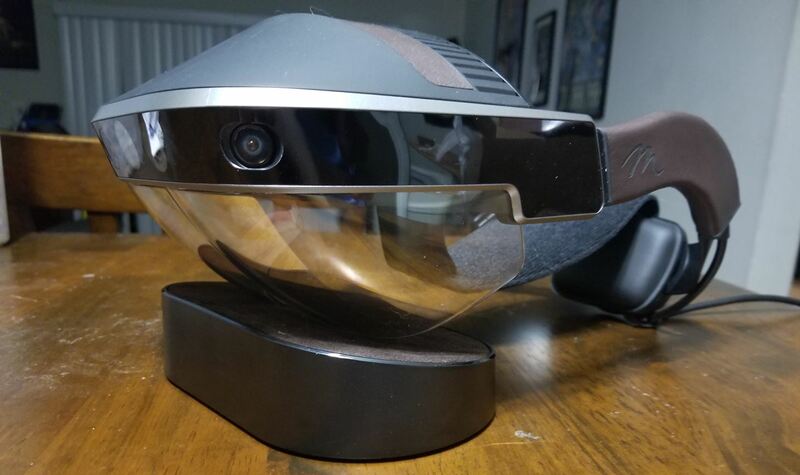 Using a semi-spherical large combiner optics system (which explains the sheer size of the device), along with the wide FOV, seems to produce a somewhat more transparent image than the HoloLens. Because of that last point, for me, when using the Meta 2, I find myself fighting to find a focus and to keep it there. Like the HoloLens, the Meta 2 also offers a collection of sensors and is also capable of creating an environment map to allow interaction with the real world. This includes the use of gestures to control the AR software being used. Additionally, Meta 2 allows a grab-and-hold gesture, which lets the user move virtual objects around somewhat naturally. However, the initial grab functionality is somewhat inconsistent. There's a valid argument regarding the notion that, due to it being a tethered device, the Meta 2 really shouldn't be compared to the HoloLens or Magic Leap. But currently, the product category is somewhat loose due to the low number of devices on the market. As the market fills out, these products will slot off into their own sub-categories. In other words, for now, as long as they are head-mounted electronic devices with see-through displays, they will be compared. Constantly hyped for several years, the newest company to show us an AR head-mounted product is Magic Leap, with the Magic Leap One: Creator Edition. Here we'll take the Magic Leap One and put it in context in terms of what it has to offer in comparison to the HoloLens and the Meta 2. In some ways, the Magic Leap One is a bridge between the HoloLens and the Meta 2. The headset is tethered, though not in the way the Meta 2 is. A cable connects the HMD to a small hip-mounted computer that handles the primary data and graphics processing. This could be a big turn off for some consumers (although the consensus around the Next Reality office is that it isn't a bother for most of us). Between the Magic Leap One's tethered brain and the company's choice of waveguides for near-eye optics, the headset is much smaller than the HoloLens and the Meta 2. As a result, the device looks great. It's much closer to the size of a pair of glasses than its competitors. That said, the device is still likely too far out there in terms of visual design for some of the pickiest computer users. And with the device's smaller size came a big trade-off: accessibility to all. 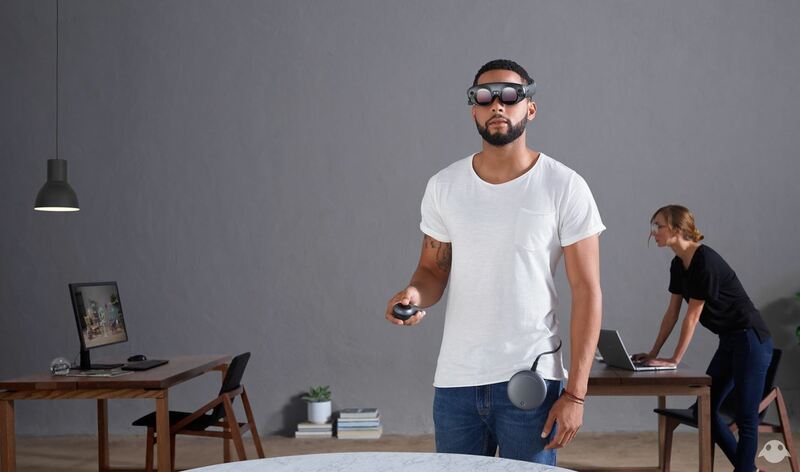 Unlike the HoloLens and Meta 2, the Magic Leap One does not yet directly accommodate people who wear corrective lenses (although the company has announced that prescription lenses will be available soon). While the unit can later be fitted with the prescription lenses a user might need, the HoloLens and Meta 2 both offer the ability to be used with glasses right out of the box. That seems like a pretty big deal, since roughly 75% of the US adult population use corrective lenses of some kind. Another feature that comes as a result of Magic Leap's decision to use waveguides for optics is something sorely missing from the HoloLens and Meta 2: depth of field. The ability to blur and focus virtual objects gives them more presence in our world when using the device. Generally, the collection of sensors on the Magic Leap One is comparable to the HoloLens, albeit with a significantly larger field of view, which adds greatly to the sense of immersion. The device also includes eye-tracking sensors, which when combined with the hand tracking abilities of the device, give the wearer more options in terms of interface and overall immersion. Being able to control your device with your eyes makes a big difference for those who grow tired of using their arms and hands for hours to control AR interfaces with gestures. That said, it remains to be seen whether or not these features will give Magic Leap the advantages necessary to get dedicated HoloLens fans and developers to switch platforms. Either way, the head-worn AR wars have begun, and it's going to be a fun ride. Solid article...thanks! A very interesting comparison of design and features. Would love to have you add the FOV for the Magic Leap. I'd be interested in knowing its size in comparison with the others. Also, a way to visualize the FOV for those of us who don't have these devices currently. Jeffrey, based on the Rolling Stone article and some math, the field of view of Magic Leap One is likely bigger than HoloLens, but probably not by much. Read more here. I would add to what Tommy said, with the choice of light fields and the form factor, specifically the lack of space to wear glasses, the ML1 displays will be closer to the eyes than the HL, which will make the FoV appear a bit bigger in itself.